Excel is the goofiest application. One one hand I have friends who use it to do actuarial calculations to determine what specific day you will die. On the other side I know accountants who are too lazy to learn Word so they create themselves a giant cell, 8.5 x 11 inches and enable text wrapping and voila -- it's a word processor. Throw in macros, VBA and its just about the most versatile application ever...and as such used for all sorts of things it shouldn't be. Because of this it shares top spot as both the best and worst application ever with Outlook...hang on, it still pales in comparison to iTunes, but I digress. Due to a client issue a few weeks back (Dr. Strangeprinter) I found myself revisiting how printers are created both En Masse and individually, and it made me more and more frustrated with the crazy, inefficient way that Microsoft makes you install a printer on a Server. Sure, if you are comfortable with scripts, command lines, witchcraft and voodoo, you can improve on this but most I run into in IT are not. 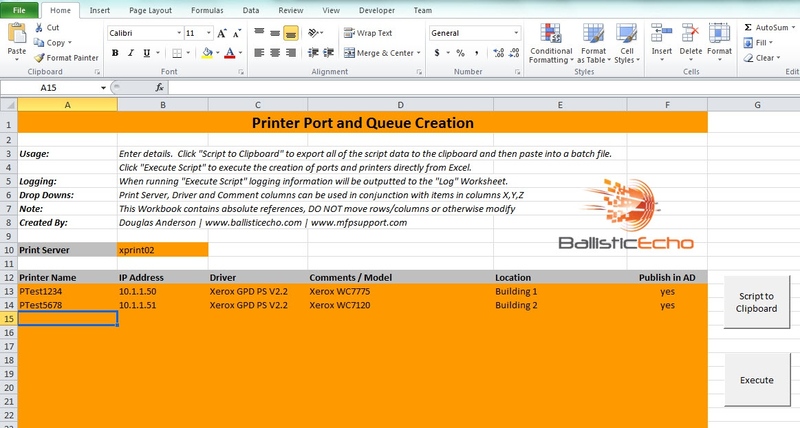 It got me thinking, the easiest way to manage a list of printer names and IP addresses was Excel, and in fact most print guys in IT start with a list like this that they work through while creating printers. Couldn't you just use that list in Excel and click a button to create printers? The simple answer, yes. And in reality the execution wasn't too complex. All you need is a little macro knowledge in Excel along with some minor VBA and you are good to go. The only caveat is that you need to pre-install the print drivers on the server. And ensure that if you are sharing from 64bit to 32bit (or vice-a-versa) that you have those drivers installed as well. Just export the driver names from Print Management Console or carefully copy the names of those installed. I'm not going to say this process is instant, far from it. But it will create a port and printer in about 15 seconds, with no additional input. If you have hundreds of printers to create it will take some time but the upside is you can sip coffee (or beer like I am now) while your workstation does the dirty work. Add to that, it's a consistent, repeatable manner to add devices and takes care of port/queue creation along with sharing, adding comments and location, while even publishing to Active Directory. Below is a screenshot, and here is the Excel file. It still needs a little work, which I fully intent to do, so come back in a few weeks. The next revision will have full logging and better (or at least some) error handling. Feel free to use, modify, update, sell, make better etc. Update: Version 3 now polls the server to determine what drivers are available based on the servers you have defined.